1. In the bowl of an electric mixer with a whisk attachment, combine cocoa, oil and sugar. Add eggs and vanilla and mix until well combined. 2. In a separate bowl, combine all-purpose flour, baking soda, and salt. Gradually add to the cocoa mixture and stir until just combined. 3. Place the mixture in the refrigerator for at least an hour or until the dough is firm before using. 5. Shape the dough into ¾-inch balls and roll in the confectioner's sugar to coat completely. 6. Place the balls in a lightly greased cookie sheet or a cookie sheet lined with parchment paper. Arrange the balls about 2 inches apart. 7. Bake the cookies until puffed and cracked on the top, about 10-12 minutes. Cookies should look undone and still soft in the center. The internal heat will cook the cookies while cooling down and will keep them moist and chewy on the inside and crisp on the outside. Cool completely. Black cocoa powder is a type of alkalized, Dutch-processed cocoa. It is available at specialty baking supply stores like SweetCraft and Chocolate Lovers. 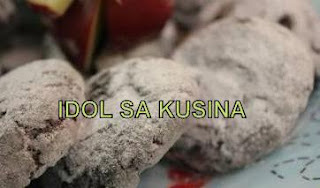 To make the usual chocolate crinkles, just use ¾ cup cocoa powder. Pwde po ba butter nalang ang gamitin ko kesa oil?